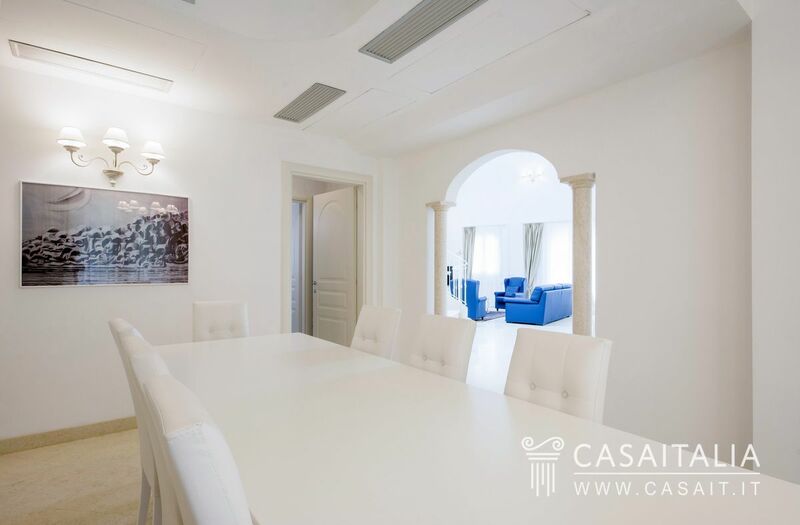 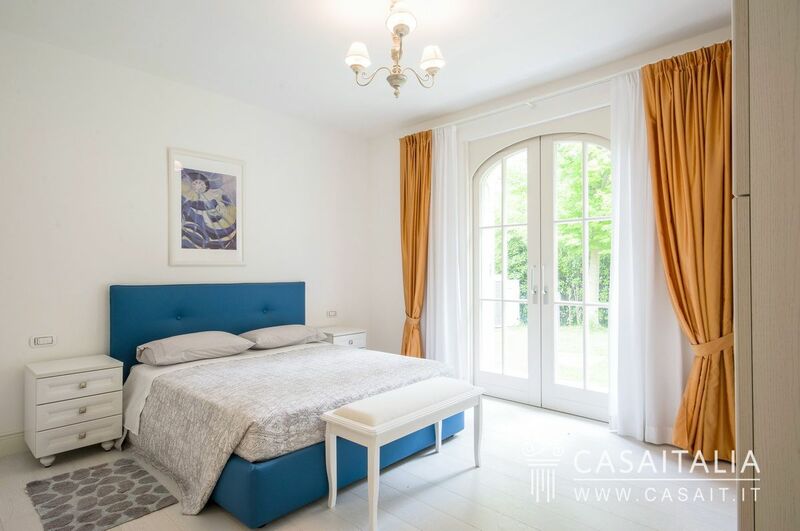 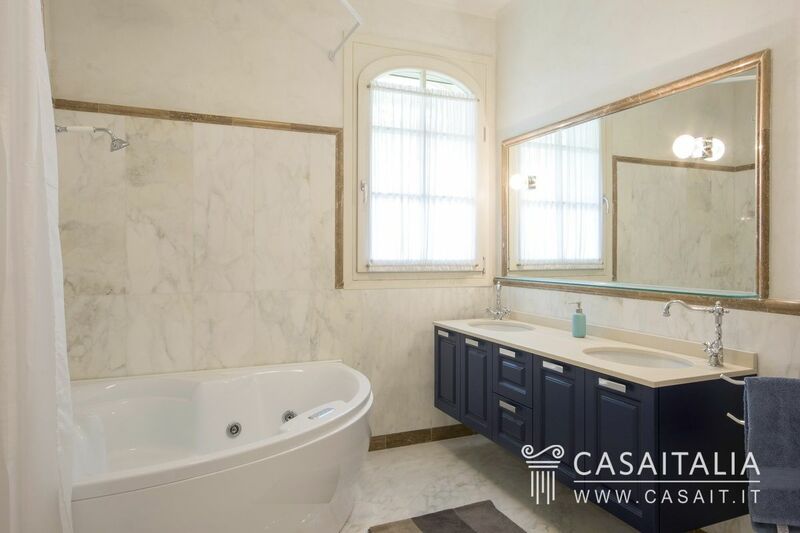 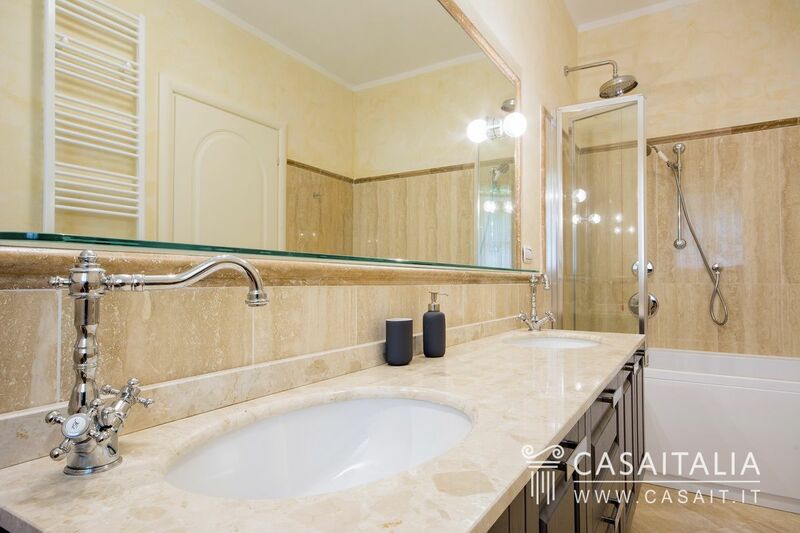 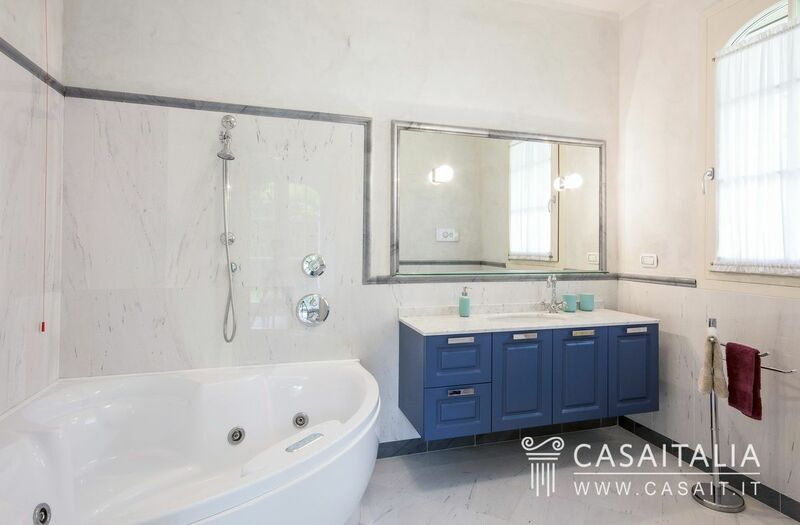 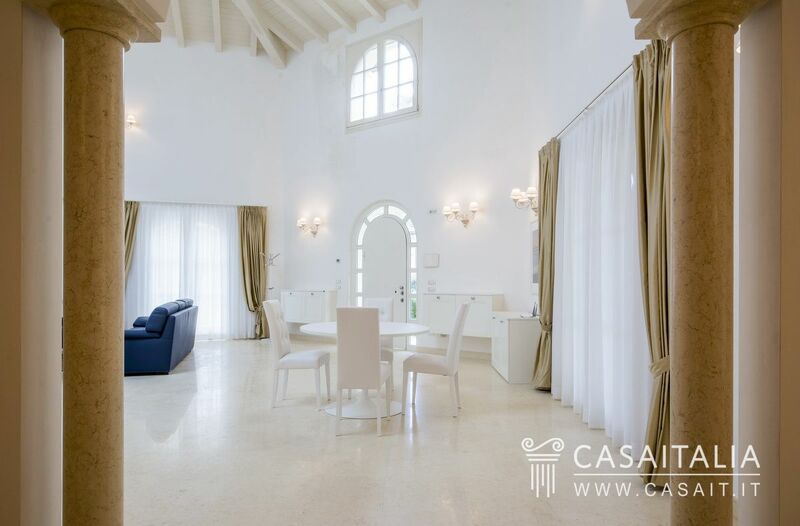 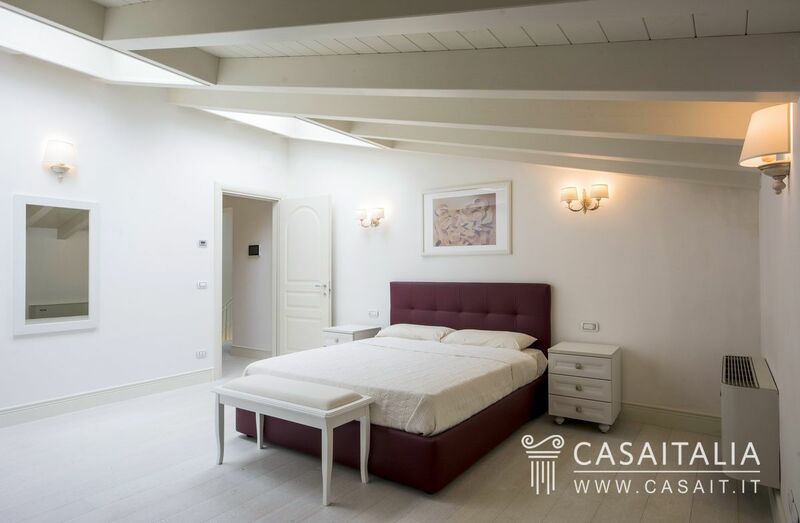 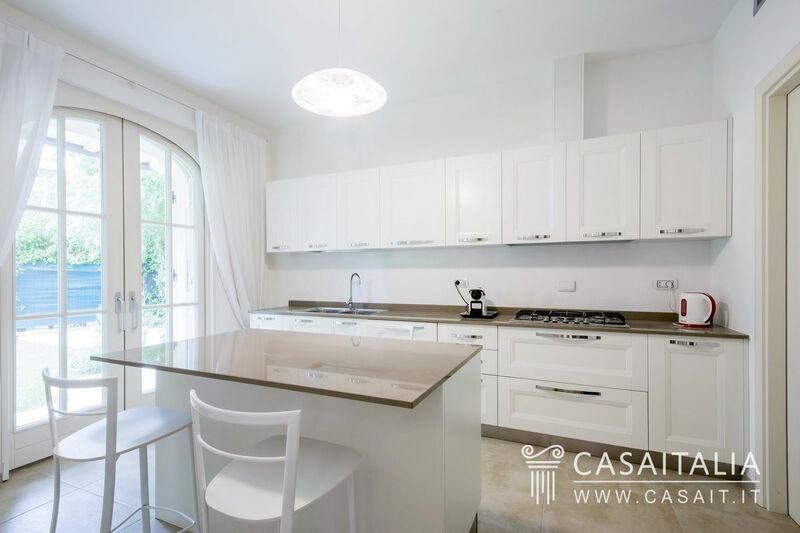 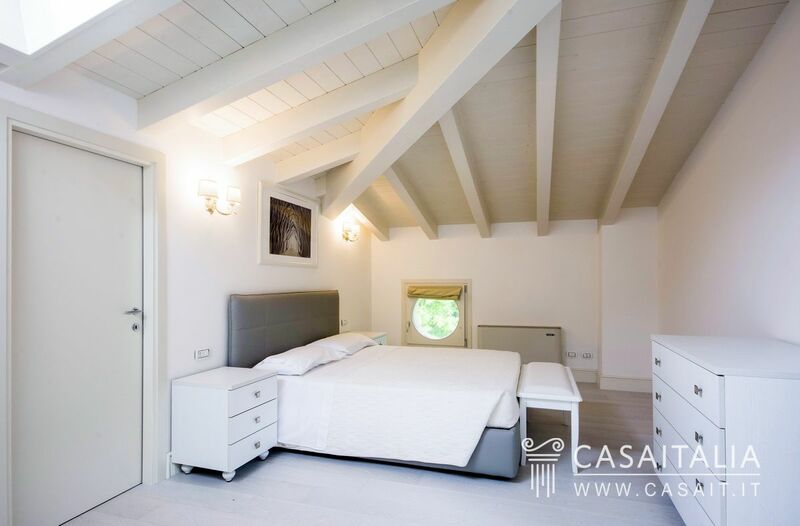 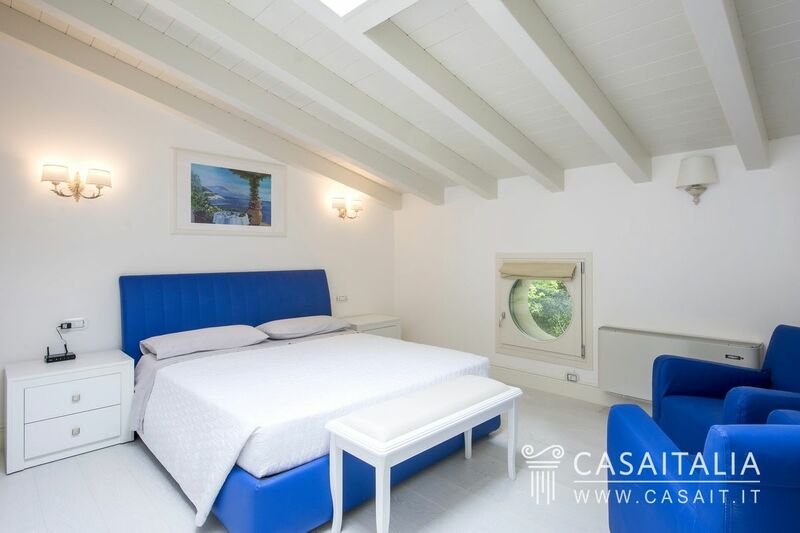 Villa Domizia is situated in the enchanting town of Forte dei Marmi, famous throughout the world for its beaches, the iconic Apuan Alps overlooking the town, its excellent restaurants, luxury shopping and the beautiful walk along the promenade. 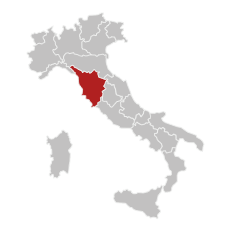 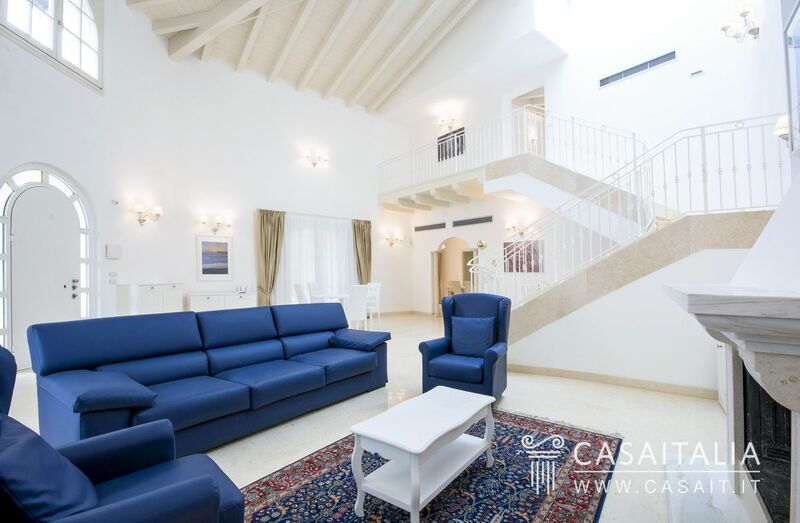 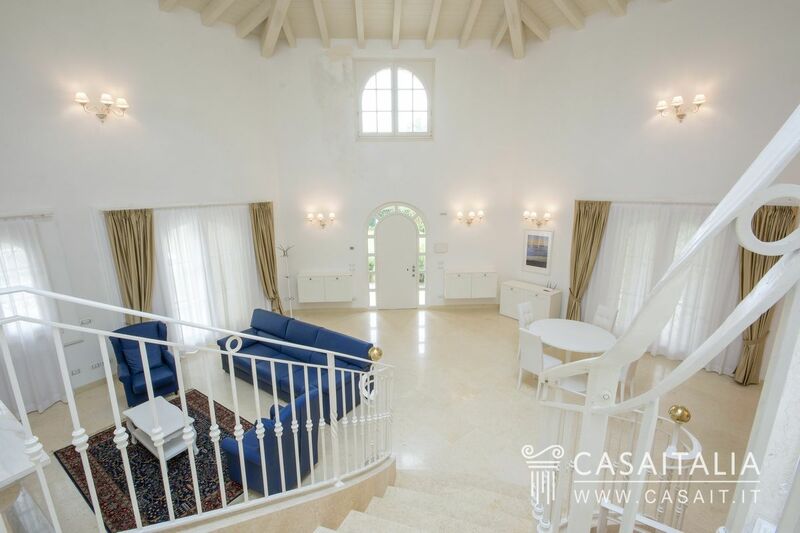 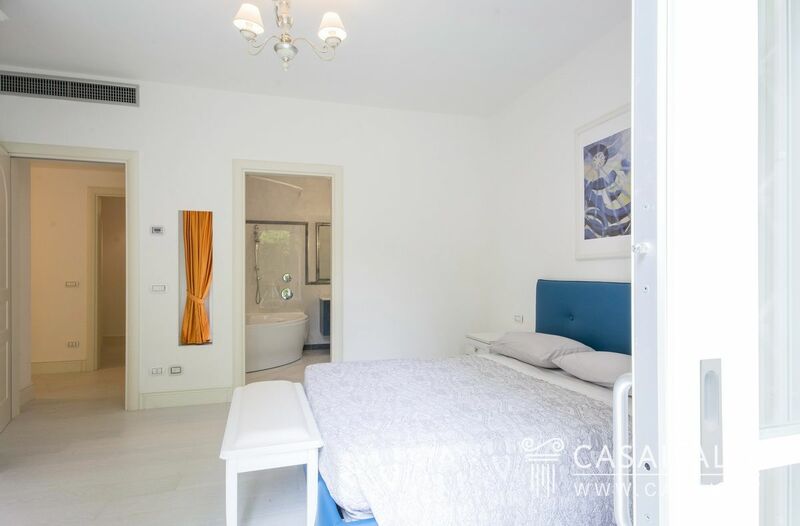 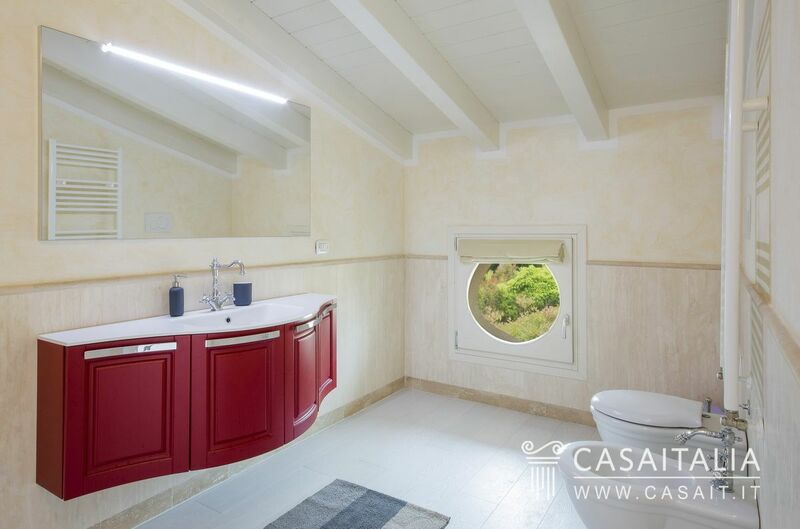 Villa Domizia is a few minutes from the centre and the beaches, located halfway between the two, where privacy, peace and quiet are guaranteed. 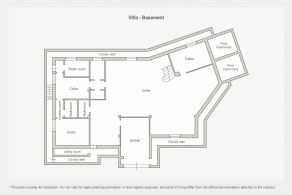 The villa is situated within a residential complex which is completely fenced in and is made up of only six villas with similar features. The property has three floors, measuring 756 sq.m in total. 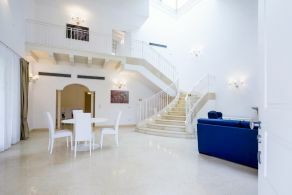 On the ground floor, which measures around 245 sq.m, the main entrance leads to the large living room with ceilings as high as the roof of the house, and which overlooks two porches measuring around 23 and 15 sq.m. 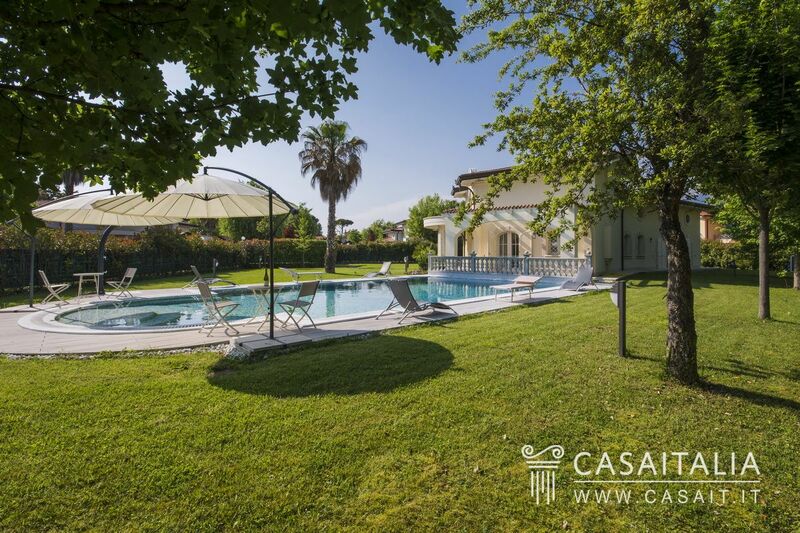 In front of the house there is the pool measuring around 80 sq.m and the garden measuring around 1100 sq.m. 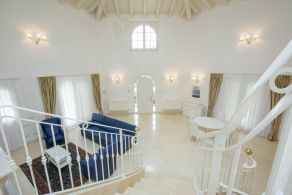 To the left of the living room there is the dining room with access to another porch measuring around 12 sq.m, the kitchen and a sleeping area with three bedrooms and 4 bathrooms. 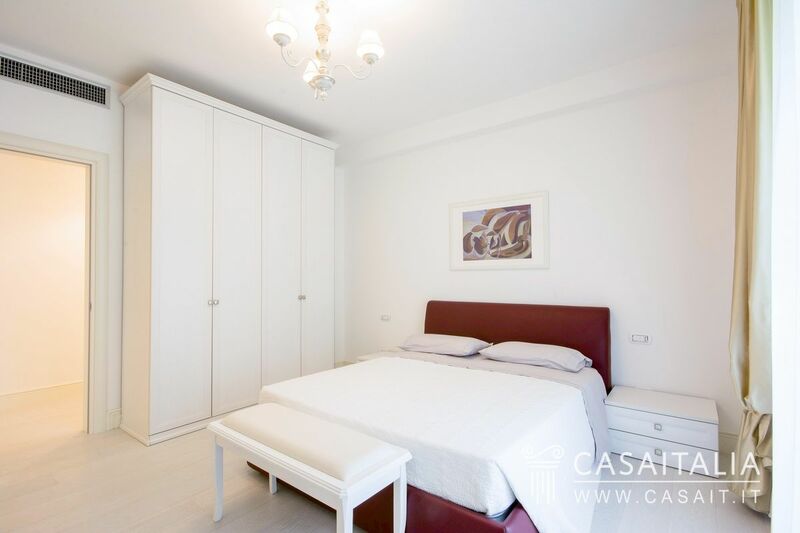 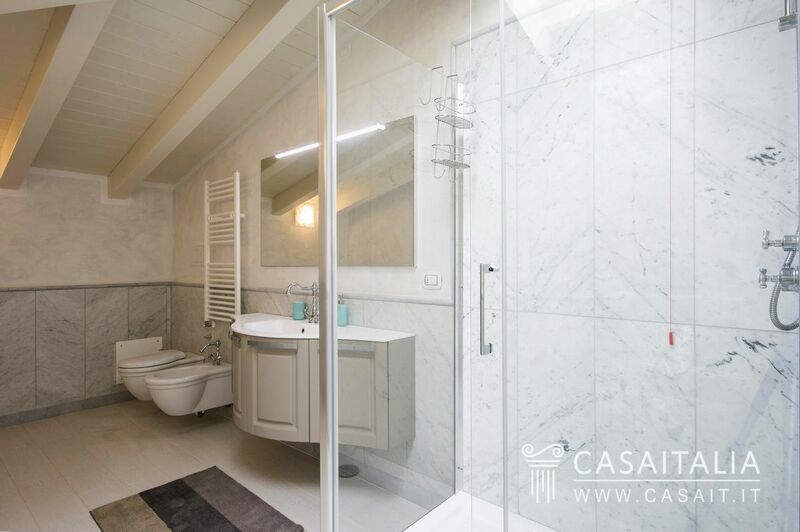 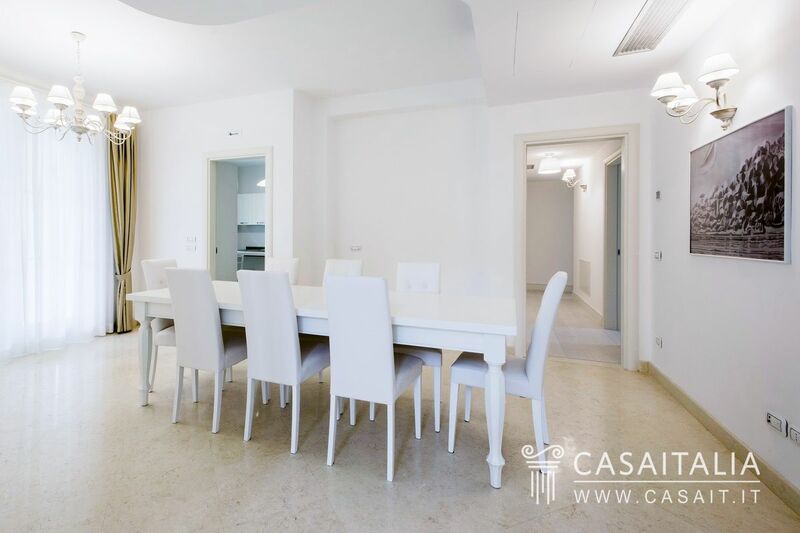 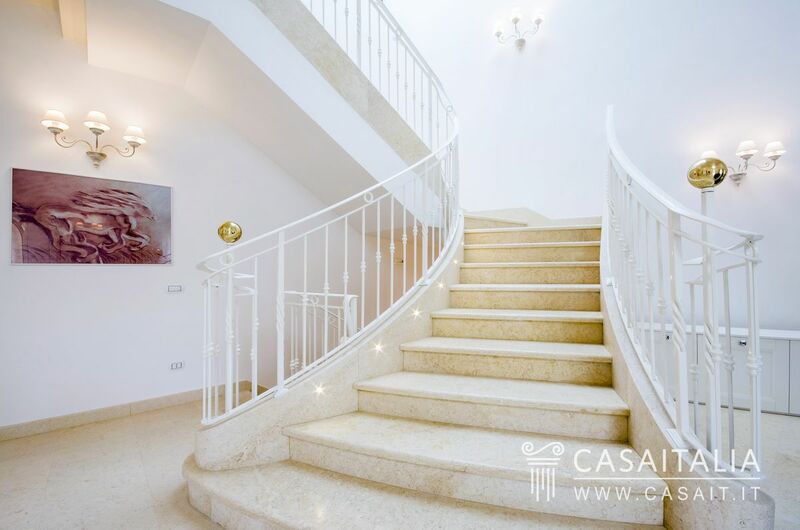 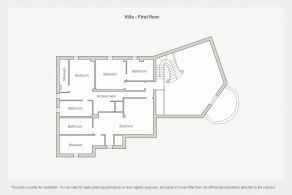 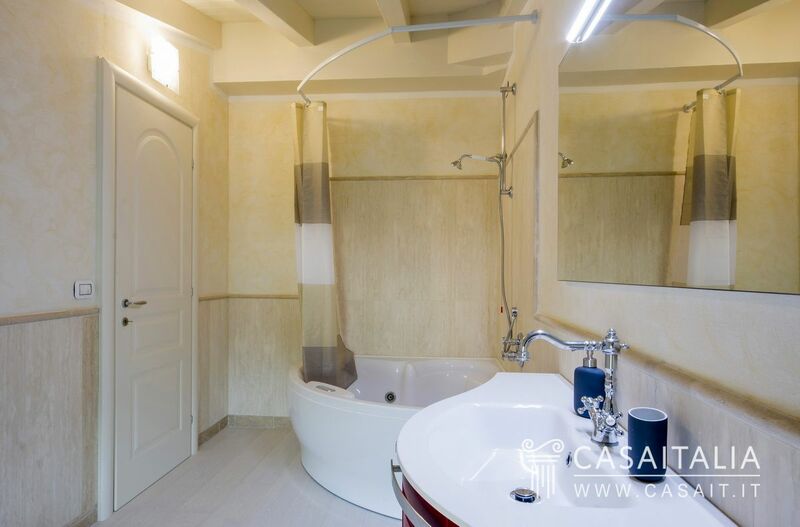 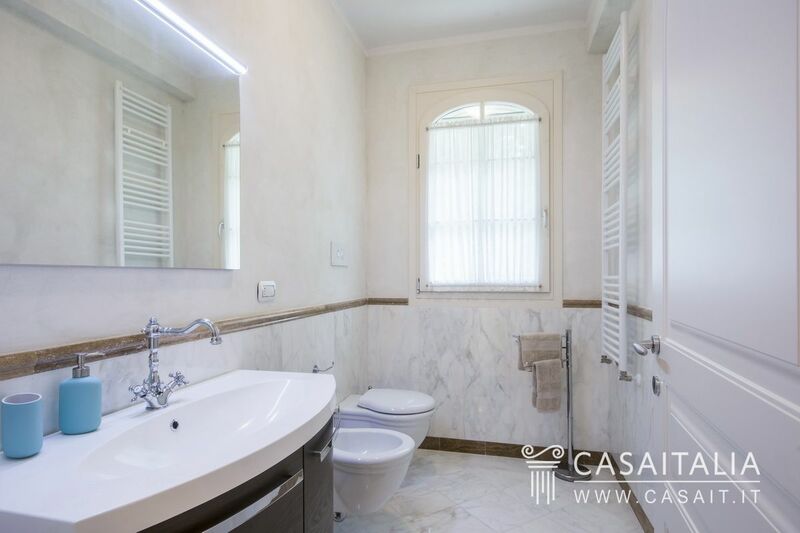 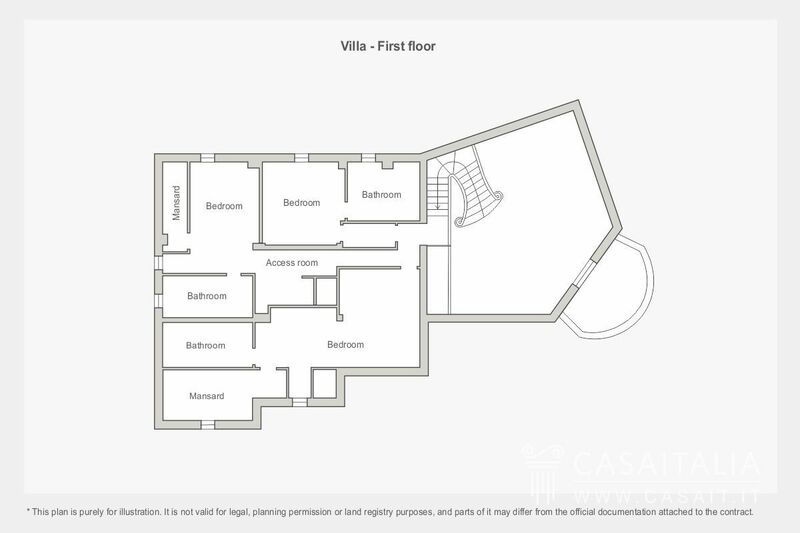 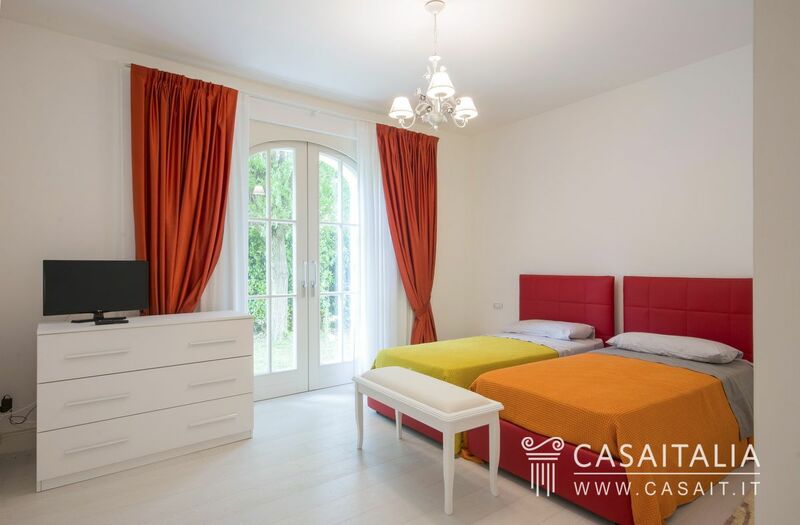 The first floor, measuring around 162 sq.m, comprises three bedrooms and three bathrooms. 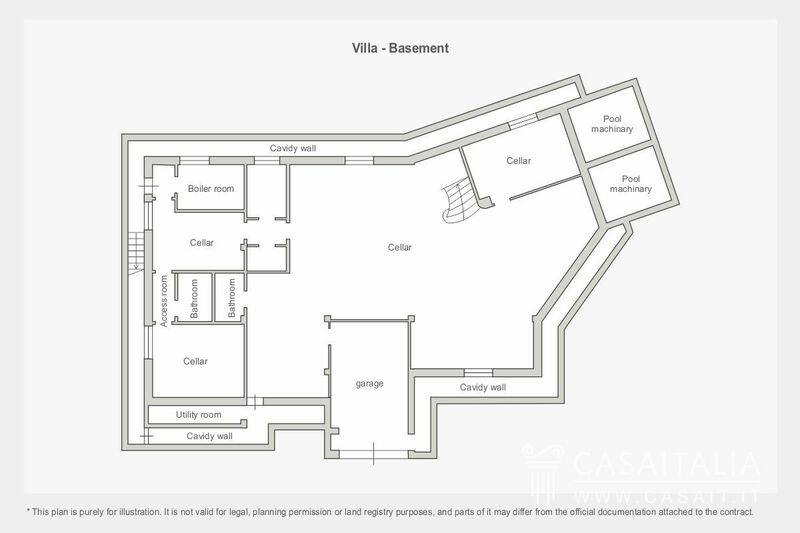 The basement floor measures around 362 sq.m and comprises a large basement room, another two spaces, two bathrooms, the laundry, a cellar and the garage, which is accessed by an underground ramp and has room for three covered parking spaces. 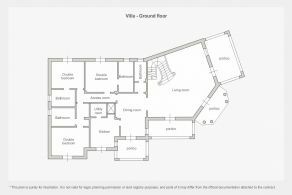 The garden is beautiful and measures around 1100 sq.m, completely surrounded by tall hedges and overlooked by three porches. 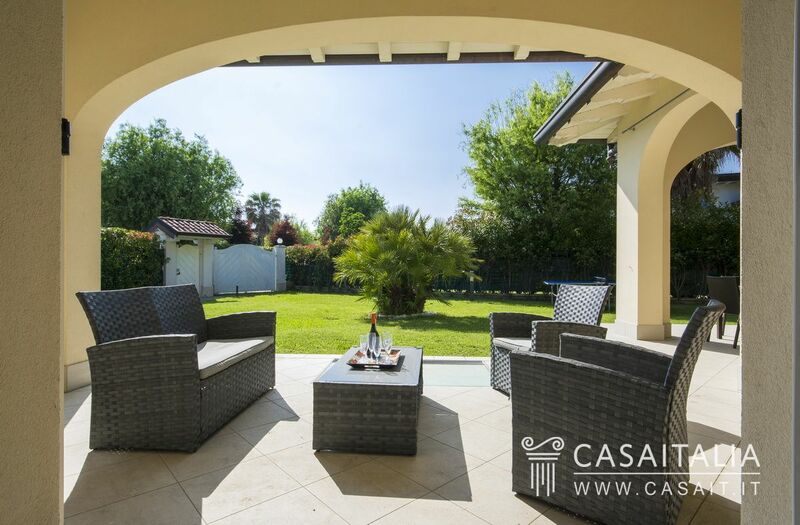 All these spaces are ideal for spending relaxing afternoons outdoors or for pleasant lunches. 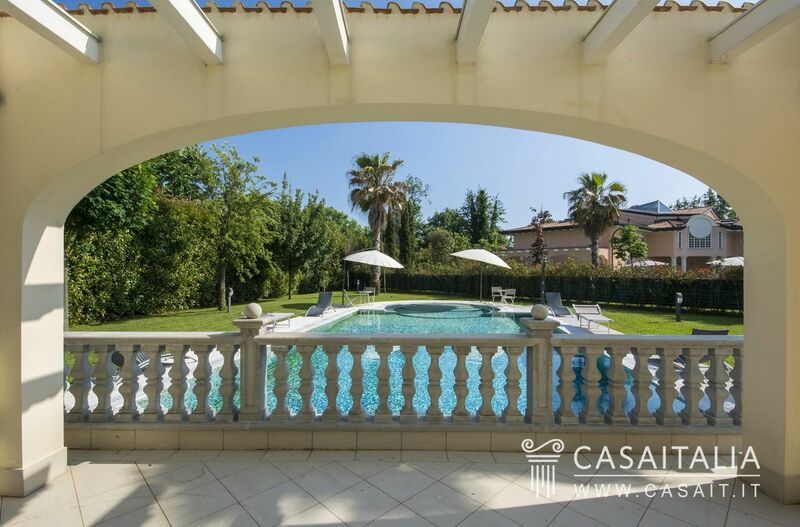 The impressive 80 sq.m pool completes the property. 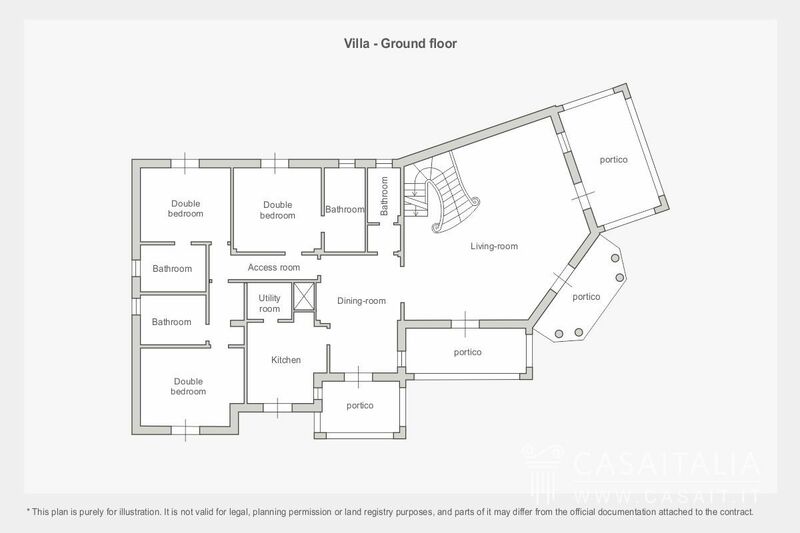 The lanes which lead to the inside of the villa provide a clean and organised architecture to the garden. 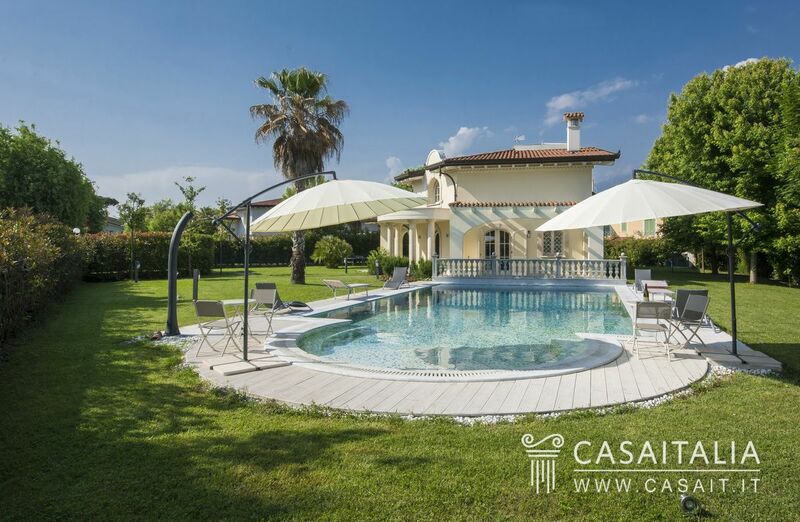 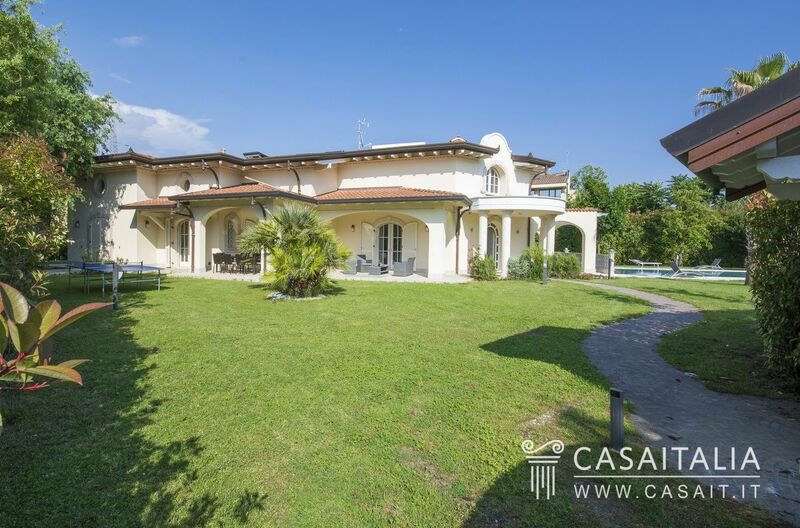 The villa was planned and designed to have a liveable outdoor space which would be well used during Forte dei Marmi’s long spring and summer period and would allow you to make the most of its unique climate.